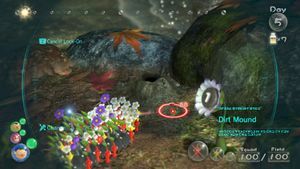 Dirt mounds are obstacles in Pikmin 3. They appear as lumps of dirt on the ground, with a hole on top that Pikmin can climb in through. The burrows inside contain items, including fragments, bomb rocks, pellets and data files. In order for the Pikmin to enter the hole, the player must have them charge at it, or throw them towards the mound. Once everything has been removed, the Pikmin come out of the dirt mound, which then collapses and becomes unusable. They become active again after a day, though, unless they had fragments in them. One near the Whiptongue Bulborb outside the landing site. Contains two bomb rocks. One near the Lesser Mock Bottom. Contains two bomb rocks. One in the second Shaggy Long Legs arena (the one with the fire geysers). Contains three bomb rocks. One near the Dawn Pustules. Contains 34 fragments. Two outside the Sandbelching Meerslug arena, atop cliffs. They contain the data files for the Sandbelching Meerslug. Two in the cave with the Bug-Eyed Crawmad and Hermit Crawmads. One contains the Bug-Eyed Crawmad data file, the other contains pellets. One outside the Quaggled Mireclops arena. Contains 20 fragments. One outside the landing site. Contains pellets. One in the arena where Captain Olimar is first encountered. Contains a data file. One in the first room, in the arena with the Bearded Amprat and Blowhogs. Contains 20 fragments. Two in various alcoves of the first room. Contain three bomb rocks apiece. One beyond the Bloominous Stemples in the second room. Contains a Secret File. One behind the electric gate, along with the Tremendous Sniffer. Contains three bomb rocks. One just outside the alcove where the Onion and SPERO are located. Contains a spray drop. One in an alcove guarded by a crystal. Contains three bomb rocks. One next to the crystal nodules on the SPERO's side of the map. Contains three bomb rocks. One on the opposite side of a reinforced wall next to the SPERO. Contains three bomb rocks. Two on the shore to the large source of water. Contains two bomb rocks apiece. One near the Waddlepus. Contains two bomb rocks. One in the same location as a dirt mound is in story mode, in the vicinity of story mode's Lesser Mock Bottom. Contains three bomb rocks. One a short walk away from the SPERO, near the Baldy Long Legs arena. Contains three bomb rocks. One in the location of the Face Wrinkler in story mode. Contains an ultra-spicy nectar drop. One near Alph's starting postion. Contains two bomb rocks. One near two Crimson Candypop Buds. Contains two bomb rocks. One in a corner of the cave, near the Spotty Bulbear. Contains two bomb rocks. One near the Rock Onion. Contains three grey 1-pellets. One on the high platform, with conveyor belts leading up to and down from it. Contains ten bomb rocks, which land on the conveyor belt below it instead of surrounding it. After any number of Pikmin go in and the digging starts (represented by the mound shaking), it takes roughly ten seconds for the first item to be spit out of the mound. Any other items will be spat out at a regular interval that depends on the number of Pikmin inside the hole, calculated at a logarithmic rate (i.e. twenty Pikmin are a significant improvement over one, but forty are a relatively minor one over twenty). Pikmin type, maturity, and spicy status do not have an impact on the speed at which new items come out. Because the number of Pikmin only influences the time it takes for the second and beyond items to come out, dirt mounds with only one thing inside of them will take just as long to clear with one Pikmin as they will with one hundred. Side view of a dirt mound. A dirt mound that has been completely emptied. A dirt mound releasing fragments. If a Pikmin is working on a dirt mound, even if it is close to the surface of the hole, it cannot be eaten by enemies. If an enemy attacks it, like for instance, a Whiptongue Bulborb's tongue, the Pikmin will squeal, but will live and continue working like normal. This page was last edited on December 1, 2018, at 18:49.